This idyllic and private location is along a tree lined drive leading from the quiet lane between Butterton and Hulme End on the Derbyshire / Staffordshire border. 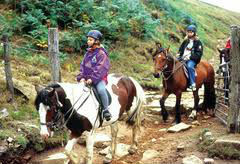 It is an area of outstanding natural beauty with lush tranquil dales and wild romantic highlands. Swainsley Farm is sheltered by the majestic limestone dome of Ecton Hill which, in the past, formed part of Chatsworth and the Duke of Devonshire’s western estate. In the 19th century Swainsley was owned by Sir Thomas Wardle. He was a well known industrialist (based in Leek with an interest in silks and dying), a friend and colleague of William Morris – both were involved with the Arts and Crafts movement. Morris visited Swainsley along with many other distinguished artists and writers associated with the Pre-Raphaelite brotherhood. Other famous visitors included Mark Twain and Baden Powell. Today, we are a smallholding of 12 ½ acres with three self-catering cottages in an area rich in birds, wildlife and flowers. Swainsley Farm lies at the heart of an area known as the White Peak, a limestone plateau of green fields and drystone walls, defined roughly as the countryside enclosed by Castleton, Buxton, Bakewell, Matlock and Ashbourne. The rivers Dove and Manifold rise in the gritstones and shales of the Axe Edge moors. They carry rainwater which has cut deeply into the gritstone and then into limestone reef knolls to form deep dales with overhanging pinnacles of rock and fast running streams full of fish. A succession of high hills and dales surround our Peak District cottages where the rivers occupy gorge-like valleys sliced into the landscape. Dovedale and the Manifold Valley are deservedly beauty spots and there are other dales nearby with rippling streams that are a delight to explore. 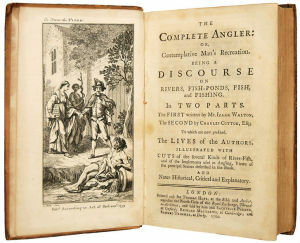 The rivers Dove and Manifold are synonymous with Charles Cotton and Izaak Walton who fished and wrote about these waters three centuries ago. The rich diversity of scenery has long been an attraction for visitors, sufficient to move the hearts and pens of many nationally known writers over the years. Swainsley Farm comprises of a farmhouse and substantial range of outbuildings originating in the 18th century. They are built from local limestone with gritstone detailing to windows, doors, chimneys, gables and copings. Chris and Liz have converted a barn and former coach house/stable block into three luxurious Peak District cottages – all have stunning views. Paths and bridleways link the Manifold Trail, which runs in the valley below Swainsley, to the surrounding limestone plateau. From our Peak District cottages you can explore this rugged landscape and its picturesque villages with their ancient churches and welcoming old inns. Other paths climb through woods to the hills which tower high above gorges and wind past fascinating mining remains at Ecton. From Bronze Age times, copper and lead deposits were worked for over 3500 years, ceasing in 1891. During this time fortunes were made and lost. 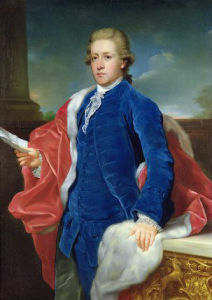 In the 18th century the Duke of Devonshire made a profit of over £300 000, said to have financed the building of the magnificent Crescent in Buxton and additions to Chatsworth House. The Ecton mines are a Scheduled Monument with the old engine house now in the care of the National Trust. The whole area is a site of special scientific Interest (SSSI). The area is steeped in history and our fields contain evidence of ancient agricultural terracing. 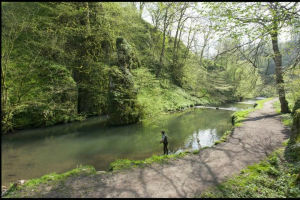 There are numerous caves in the Manifold Valley, the biggest and best is known as Thor’s cave at Wetton Mill (about 1 1/2 miles south of our Peak District cottages). This cave is 250 feet above the river and can be approached from a steep but spectacular footpath. These caves were the homes of stone age dwellers dating back at least 50,000 years and the surrounding hills have many burial mounds, stone circles and other religious sites of prehistoric people. Under recent legislation large parts of Ecton Hill have been given ‘Access Land’ status – which means that visitors are free to roam at will. Some areas are owned by the National Trust and a large section has been designated an Area of Special Scientific Interest for the intensity of its wild life and flowers. Swainsley Farm and its Peak District cottages occupy an area of south facing land along the north bank of the River Manifold. There is considerable ecological interest in the fields, slopes, hollows, wooded banks and riverside of our land. 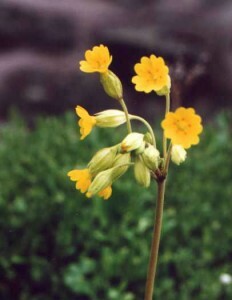 In a botanical survey carried out by the Peak District National Park Authority in 2002 a total of 86 species were recorded including rare moschatel, agrimony, angelica, betony, ladies mantle, water avens and ladies bedstraw. 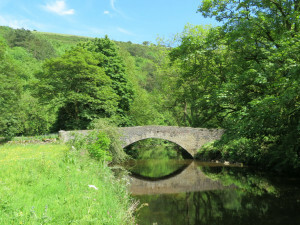 Wooded banks with grassy glades contain anemones, violets, primroses and bluebells while hedgerows and boundary features around Swainsley and its Peak District cottages have saxifrage, harebells, wild strawberries, salad burnet and cowslips. In summer flower-rich swards are a riot of colour. The limestone dales of the White Peak are exceptional for their ash woodlands – amongst the finest in Europe and most extensive in Britain. Wych elm remains in many of the woodlands despite the ravages of Dutch Elm disease elsewhere. Birch and holly woodland occur on upper dale slopes. The Manifold River is home to significant stocks of crayfish and water voles. Fish include bullhead, brook lamprey, wild brown trout and greyling. Above river level small springs are a haven for scarce plants and invertebrates. The area is rich in birds and wildlife. As well as badgers, foxes and rabbits you may encounter voles, polecats, water rats, brown hares, weasels and stoats. 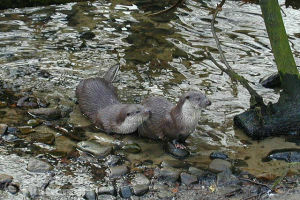 There have also been a number of otter sightings. Caves and trees in the valley are home to several species of bat. 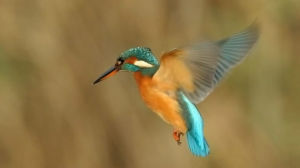 The wonderful habitat around Swainsley and its Peak District cottages is an essential refuge for many types of bird including herons, king fishers, buzzards and owls. 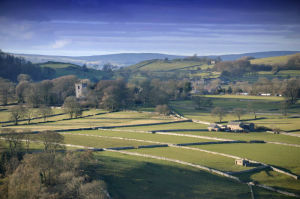 Swainsley Farm is surrounded by some of the prettiest villages in the National Park: Alstonefield, Butteron, Wetton, Warslow, Grindon and Hartington. There is a superb choice of pubs and restaurants (some award winning). Butterton (1 mile) has a pub (the Black Lion), butchers shop and Post Office. The hamlet of Hulme End (1 ½ miles along the Manifold Trail) has a pub/restaurant (the Manifold Inn). Warslow has the Greyhound (¾ mile through fields). The larger, and very picturesque village of Hartington (with its duck pond, tearooms, Cheese & Wine Shop, Village Stores and a newsagents) has the Charles Cotton Hotel and the Devonshire Arms and is approximately three miles away. Alstonefield is a lovely village, also about 3 miles away, with a wonderful gastro-pub, the George overlooking the village green. The Peak District National Park Authority has a visitor centre based in the restored former station of the Leek and Manifold Valley Light Railway (L&MVLR) at Hulme End. The Manifold Trail follows the route of this former, narrow-gauge railway line between Waterhouses and Hulme End (approx 9 ½ miles) which operated between 1904 and 1934. The line mainly carried milk from dairies in the region, acting as a feeder to the standard gauge system at Waterhouses. It also provided passenger services to the small villages and beauty spots along its route. The track, which is surfaced and level, is shared by walkers, cyclists and pony trekkers – it is also ideal for wheelchair users and parents with push chairs. The Manifold Trail takes you through some of the most dramatic, breathtaking scenery in the National Park and is directly accessible from Swainsley Farm. We have some adult cycles which our visitors are welcome to use at no charge. 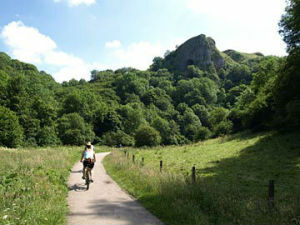 All types of bikes are available for hire at Waterhouses. There are a number of tea shops along the Manifold Trail (an especially good one has recently opened in the old engine shed at Hulme End: the Tea Junction). So, if you’re looking for an ideal base from which to explore the Derbyshire Dales, Staffordshire Moorlands and the Peak District National Park then come and visit Swainsley Farm! 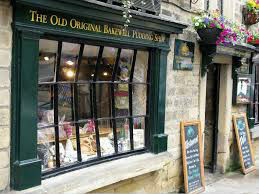 Bakewell, home of the famous almond flavoured tart, nestles under wooded hills on the banks of the River Wye. The river is crossed by a 13th century 5-arch bridge which is still open to traffic. Unspoilt and very picturesque, Bakewell is a lovely old town (the largest in the Peak District National Park). The architecture of its fine old Georgian buildings is complemented by a large variety of small shops, excellent eating places and pubs. Generally held on the last Saturday of every month, the District Council’s popular Bakewell Farmers’ Market is now regularly attracting more than 5,000 visitors. Bakewell Show is held in early August and is Derbyshire’s premier agricultural show. Elegant Chatsworth House and Park is 4 miles east of Bakewell and the medieval manor of Haddon Hall (…‘the most perfect house in England’..) with its beautiful gardens is 2 miles south. 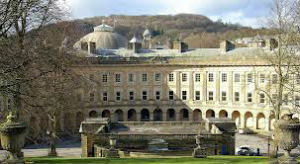 Buxton is a fine spa town set in the Derbyshire hills. It was founded by the Romans in 79 AD and is famous for its hot springs and baths. Spring water flows freely from St Annes well for use by the general public. Over the years the town has benefited from the patronage of the Dukes of Devonshire and has many magnificent 18th and 19th century buildings including: The Crescent, Pavilion Gardens, Opera House and Cavendish Hospital (now the Buxton campus of the University of Derby). The Opera House has a varied programme of plays, music festivals, operas, concerts and pantomimes throughout the year. Buxton is a thriving market town with many small shops and well known high street names : Marks and Spencer, Boots, Next etc. There is a wealth of cafes, restaurants and pubs. Matlock owes much of its development to the Victorian interest in hydrotherapy – the treatment of ailments with water therapies (many of the town’s grand buildings were hydrotherapy hotels). Located on both banks of the River Derwent, the town is set around Hall Leys Park which provides a lovely setting for recreational activities including bowls, miniature golf and a miniature railway. The town centre is busy with many small shops and places to eat. 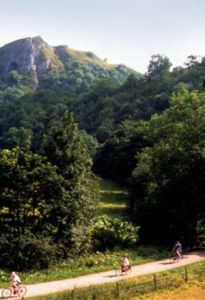 South of Matlock is Matlock Dale, a dramatic limestone gorge overlooked by High Tor (which provides some of the severest rock climbing in the country). From the foot of High Tor runs a cable car across the gorge upto the Heights of Abraham where visitors have wonderful views of the dale and Matlock Bath. This historic little village, which was a health spa in Georgian and Victorian times, has many attractions including the Peak District Mining Museum and Gullivers Kingdom (for small children). From the end of August to Late October Matlock Bath hosts the Venetian Nights which includes illuminations and firework displays. Ashbourne is a prosperous market town of mediaeval origins situated in a green valley on the east bank of the River Dove, It has a considerable legacy from the past in the form of its fine 13th century church, Elizabethan grammar school and numerous groups of 17th century almshouses. Located at the meeting point of six turnpike coaching roads, Ashbourne retains its cobbled market place with alleys and yards which are a delight to explore. It has some of the finest Georgian buildings in Derbyshire. 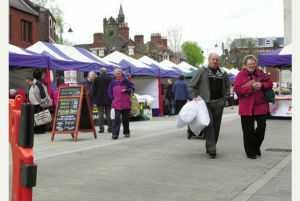 A thriving agricultural town, Ashbourne is renowned for its boutiques, antique shops, bistros and speciality food shops. Every year at Easter the Shrovetide Football Game takes place – this event has been held for nearly a thousand years and bears little resemblance to normal football. The rough and boisterous game takes place over two days with the town centre boarded-up and goals placed three miles apart. Anybody can take part and there are few rules – not for the faint hearted! Leek is situated in the Staffordshire Moorlands (part of the southern uplands of the Pennines) and is overlooked by a spectacular rocky escarpment known as the Roaches. It is an ancient borough and takes its name from Dieulacres Abbey founded in 1214 on the banks of the river Churnet. During the 17th century silk manufacturing and dying was established and continued to flourish in the town. In the 19th century William Morris, founder of the Arts and Crafts movement, visited Leek many times and his distinctive designs were used in numerous silk products. Morris and his associates have left a significant mark on the art and architecture of the town. Centred around the old, cobbled market place, the town has many excellent small shops, cafes, pubs and antiques emporia.